My Little Patch of Sunshine: Another Coppertone Summer! 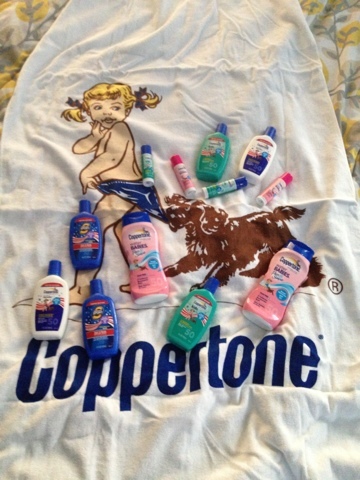 I'm happy to say that we are an official Coppertone Family again this year! Living in Arizona, sun protection is important year round! We love the Coppertone products and I loved the selection of lotions we received. This year, we are headed to the National Stuttering Association National Conference right here in Arizona! We're staying at the beautiful Westin Kierland Resort, and I know we will use plenty of sunscreen enjoying those pools! I will be packing extra to share with our NSA friends as well. We spend plenty of time in our pool, and unless the sun is down, the kids all know to slather on the sunscreen lotion! I like the pleasant scent of the Coppertone products and I especially love the sticks for easy application on everyone's face and tips of ears. If you're headed out in the sun, don't forget your sunscreen! Yer definitely gonna need the sunscreen this summer! Dang AZ is hot right now. Congrats on being chosen as a Coppertone Family again!